Iraq's Kurdish Region Votes In Controversial Independence Referendum : The Two-Way The vote is seen as a way to signal the ethnic minority's desire for self-determination, despite strong opposition from regional and international powers. Turnout reportedly was high. A volunteer looks at a voter's ballot as she walks out of a voting booth on Monday in the disputed city of Kirkuk, Iraq. Kirkuk was essentially under the control of the Iraqi government before it was seized by ISIS three years ago, NPR's Jane Arraf reports. But it was Kurdish forces that wrested control of the city from ISIS fighters. "It's a very controversial thing, holding the vote at this time, in this place," Jane says. Turnout reportedly was high. More than an hour before polls closed, the Kurdish Rudaw TV station said that at least 73 percent of eligible voters had taken part in the poll. Kurds are relatively autonomous in Iraq — as Jane has reported, they "control the land borders with neighboring countries, elect their own parliament, maintain their own security forces (known as the peshmerga) and draft their own laws." The Kurdish region's president, Masoud Barzani, said the night before the vote that "we are ready to pay any price for our independence," according to The Associated Press. "Iran and Turkey have warned the Kurds not to go ahead with the vote. The U.S. wants to avoid the prospect of another conflict between Baghdad and the Kurdish government while they are still fighting ISIS. After 2003, Kurdish leaders agreed to an Iraqi constitution that calls for negotiations over disputed areas, so holding the referendum in Kirkuk and other cities now is seen as provocative. "Iraq's neighbors are worried that a Kurdish state would encourage their own Kurdish populations to try to break away." 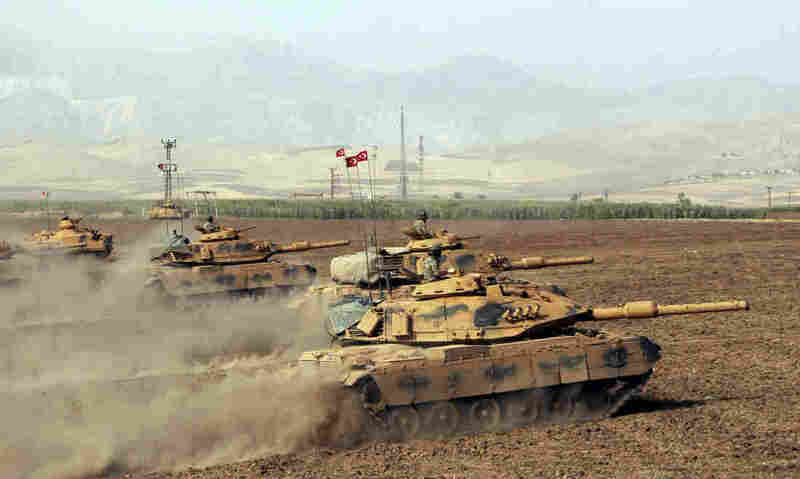 Turkish President Recep Tayyip Erdogan said that Turkish military exercises were happening near the Iraqi border and added that "our military is not (there) for nothing," the AP reported. On Saturday, according to the wire service, "Turkey's parliament met in an extraordinary session to extend a mandate allowing Turkey's military to send troops over its southern border if developments in Iraq and Syria are perceived as national security threats." One polling station that Jane visited in Kirkuk today is in an area primarily home to Arabs and Turkmen. However, she said "almost every voter who has come in here ... has been Kurdish. 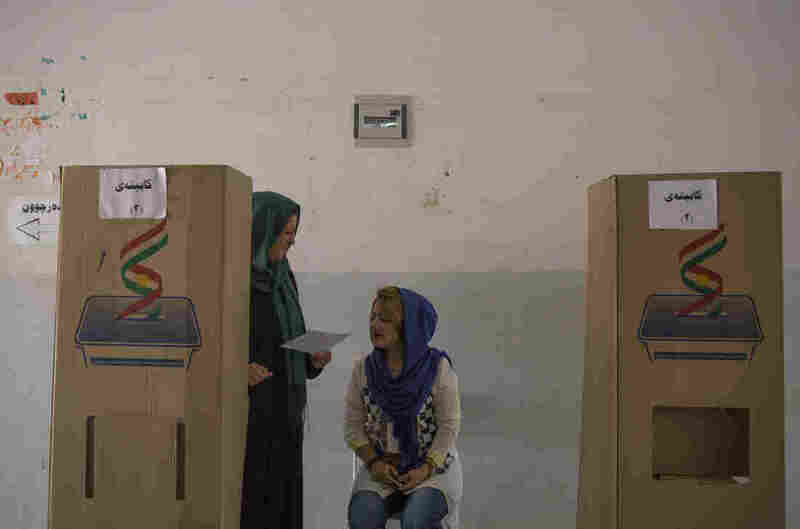 The Turkmen and the Arabs are basically boycotting this vote." Rudaw reports that after the polls close, a curfew will be imposed in Kirkuk. Even though the vote is nonbinding, the Kurdish leadership sees it as a way to send a signal to Baghdad about the region's desire for independence. "The Kurds are hoping that Iraq will reopen talks," Jane said. "Iraq has made clear that it's not going to do that, so they might actually be heading into quite a dangerous stalemate." Reuters reports that "final results were expected within 72 hours."